Solar energy is a great way for homeowners to not only contribute to conservation efforts, but also make their home more efficient and potentially lower bills. It was originally discovered in the 1830s by British astronomer John Herschel, who created a solar thermal collector box (which absorbs sunlight to collect heat) to cook food during an expedition in Africa. Today, the process is a lot more complicated, but exponentially more people are upgrading their homes to a solar energy setup. For the home, solar energy is made through photovoltaic (PV) devices. Individual PV cells are grouped together and placed in such a way that sunlight hits the devices and converts the energy to electricity. The size of these can range from something as small as a watch battery or calculator to systems that power a home or even large power plants. A major advantage to solar energy is that is does not produce air pollutants, carbon dioxide, or greenhouse gases, all of which are big contributors to environmental damage. Does your roof have clear and unobstructed access to sunlight most or all of the day throughout the entire year? Is your home’s roof or area where the panels would be placed large enough to accommodate all the necessary equipment? 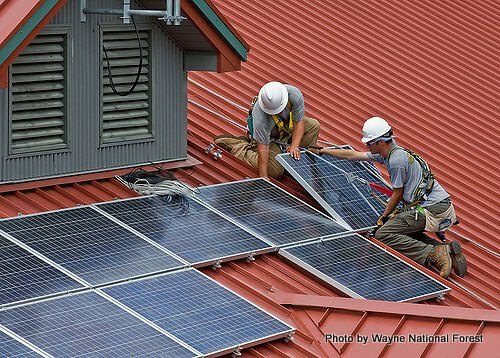 Does your town or city take any issue with solar equipment being installed? Is it worth the investment for you and your family? Next contact a solar energy professional that can assist in determining what system will best fit your needs. PV systems can use both direct and scattered sunlight, but the amount of electricity that can be generated by any given system depends on how much sunlight reaches it. The southwestern part of the United States receives the most amount of solar energy, so PV systems will function most effectively there. This is not to say, however, that solar systems can not be installed and used successfully in other parts of the country. Solar energy specialists can perform evaluations on a property and the conditions present to determine whether it would be a good candidate for a PV system. They can also determine the correct orientation and tilt for the panels for optimal performance. Before selecting which system is best, it is wise to calculate your home’s energy consumption. This can be done by looking at utility bills from the past year and recognizing consumption trends. By understanding how much energy your home needs, you can try to reduce the electricity use so that the PV system put in place isn’t as large, lowering both up-front and operating costs. Towns, cities, neighborhoods, and condo associations may have special permits or permissions that need to be obtained prior to the installation of a PV system. These may include building permits, electrical permits, or even both. Of course, these may carry an extra cost for the installation of your system. Some PV providers will include these additional costs in their overall estimate, but in some cases they might not know how much the permits will cost. As such, this is something that should be figured out at the beginning of any solar system installation process. While codes for PV systems may vary somewhat, many are based on the National Electric Code, spelling out requirements for the design and installation of reliable and safe solar systems. If you’re one of the first in your area to acquire a PV device, there may not be code in place. If this is the case, officials should still be notified and can work with your solar professional to determine what guidelines will need to be followed along the way. Condo or homeowners' associations may require permission prior to installation, so plans should be fully formed and submitted by your PV system professional. You cannot begin work until everything that will be installed is reviewed and approved. Tune in next time to learn more about how you can finance and save money when installing a solar energy system in your home! U.S. Department of Energy. (July 15, 2012). Planning a Home Solar Electric System. Retrieved from http://goo.gl/2HgKQo. U.S. Energy Information Administration. Renewable Solar. Retrieved from http://goo.gl/uF1yoS. Massachusetts Clean Energy Center. 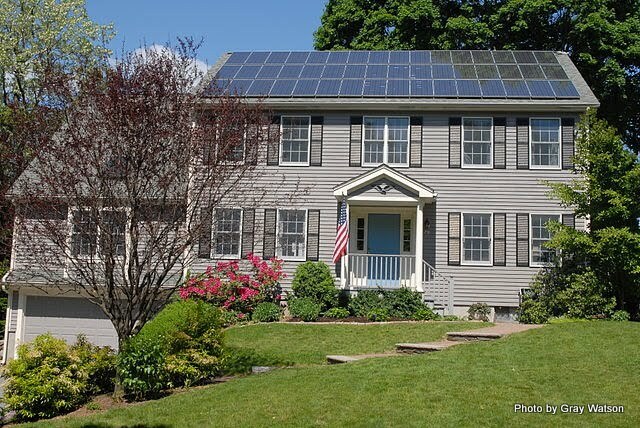 Massachusetts Residential Guide to Solar Power. Retrieved from http://goo.gl/HYRZ1s. Watson, Gray. Photovoltaic solar panels on the roof of a house near Boston Massachusetts [image]. Retrieved from http://goo.gl/Iv91q3. Snyder, Alex. (July 15, 2009). Wayne National Forest Solar Panel Construction [image]. Retrieved from https://goo.gl/IAoUJ5.